SWISS is proud to be The Airline of Switzerland. We create value for our customers by offering a distinctly “Swiss” air travel experience. Throughout our history, Swiss traditions such as a commitment to the highest quality, our multilingualism or our diverse cuisine have shaped and flavoured our business. But the world has not been standing still. Globalization and technology have disrupted many businesses. Aviation is not immune: our industry is going through a phase of tectonic changes. So is there still a place for traditions in such a fast-changing world? For me the answer is clear: yes. All the more so, in fact! The importance of traditions is actually increasing in today’s rapidly-changing and unstable environment. Which is why when we change our business model, we must build on the strengths of our heritage. A tradition is something – a belief, a custom, a method – that is passed on over time, from generation to generation. The traditions that define SWISS stem from the values and the heritage of its country of origin: Switzerland. Even in today’s globalized world, our core, our work method, our product and our partnerships are all shaped by genuine Swiss traditions. First of all, Switzerland’s prosperity is based on its tradition of openness. Located in the heart of Europe and on the major north-south traffic routes, our country has always been a hub for business, art and tourism. In the same spirit, SWISS’s raison d’être is to connect Switzerland with the world. Our product offers are rooted in the demand for air travel in Switzerland. We currently offer over 100 direct destinations, which is quite remarkable for the national airline of a country the size of ours. With demand shifting overseas to the emerging markets, one tourist in three arrives in Switzerland by plane. Some 43% of our exports (by value) are also shipped by air, as Switzerland’s industrial structure is based on high-value technology and luxury goods. Direct connectivity is a key locational factor for many of the international companies that operate out of Switzerland – be it Swiss companies such as Nestlé or Roche or foreign ones such as Google or Mondelez (Kraft Foods). Through its systemic role here, aviation contributes over CHF 30 billion to Switzerland’s GDP and generates more than 190,000 jobs. Secondly, with around 70% of our workforce being Swiss nationals, we are shaped at SWISS by Swiss work traditions. In our attention to detail, our hospitality and our focus on quality, we differentiate ourselves through the same characteristics that have made Switzerland a prime tourist destination and an economic powerhouse. Similarly, most of our pilots and cabin crew members, and also our various office staff – product designers, marketers, revenue managers and more – have enjoyed the high-quality Swiss education system. We continue to build on these roots. We train over 60 apprentices and 130 interns every year. We also maintain close ties with various Swiss universities, and offer a dedicated graduate trainee programme. Thirdly, SWISS is deeply embedded in Switzerland’s economy. Over 70% of our on-board products, for instance, are Swiss – from Quöllfrisch beer to Nespresso coffee to La Prairie beauty care. Every year we serve 2.4 million bottles of Swiss wine, two tonnes of Bündnerfleisch air-dried beef and 16 million(!) chocolate bars. Another example here is our award-winning “SWISS Taste of Switzerland” gastronomic concept for our intercontinental flights, which invites top Swiss chefs to interpret the culinary variety of our home country in their own unique ways. The programme was launched over ten years ago, and has been highly successful: we can’t even accommodate all the requests from potential partners who wish to demonstrate their art in our First and Business Class menus. Switzerland has the world’s strongest “country brand”, and we are immensely proud to bear the Swiss cross on our tailfins. We carry the Swiss flag and traditions all over the world. We are an ambassador of Switzerland. While we are shaped at SWISS by our traditions, we cannot close our eyes to the massive changes that are currently taking place. There is no tradition in business models! At the industry level, the global economic landscape is changing. Economic growth is shifting to the East. Air traffic volumes in the Asia-Pacific region are expected to grow by 5% a year between now and the mid-2030s, while the growth in Europe is likely to hover around 3%. Simultaneously, the constraints in Europe are getting tighter. Noise and environmental concerns are top of the agenda in Europe’s post-industrial nations. As a result, air traffic infrastructure has reached its limits. Zurich Airport, for instance, is at its capacity limits at peak times, and its night flying ban is more rigorous than that of any comparable European hub. New competitors have also emerged. In Europe, the two main low-cost carriers, Easyjet and Ryanair, have captured the largest share of intra-European flights. Easyjet is now the clear market leader in Basel and Geneva. And on intercontinental routes, the emergence of the large state-owned carriers from the Middle East and Turkey is increasingly challenging the viability of the European hub carriers’ business models. With access to almost unlimited state funding, these carriers offer a top-of-the-line product coupled with unrestricted infrastructure. At the customer level, digitization is changing customer behaviour. Sales are shifting online, often aggregated through tools such as ebookers or skyscanner. The result is full pricing and product transparency, along with booking convenience. Price has become the main decision-making criterion, effectively making flying a commodity. Customers increasingly purchase their tickets online, a trend that has had a significant impact on travel agents. In addition, the customer is now used to purchasing a flight anywhere, at any time and with any given device – ideally with a single click. Linked to this development is the fact that customer needs are becoming more individual. A customer used to Amazon or Spotify’s amazing recommendation engines expects SWISS, too, to recognize their needs, and to offer them a tailor-made product at low entry prices. The short-haul business traveller does only want carry-on baggage; the student traveller has no desire for a high-end inflight meal; the retiree traveller wants the full care package. And all these wishes have to be accommodated with consistent quality across all flights. In summary, then, we must create additional value for the customer beyond the flight itself – fulfilling their individual needs and giving them adequate choice. We launched our “Next-Generation Airline of Switzerland” strategy at SWISS in 2014 to address these challenges. The strategy is based on the appreciation that we must modify our business model, building on the strengths of our Swiss heritage. To begin with, we aim to further strengthen our best-in-class team. This is essential, as our workforce is growing: we will hire over 800 new recruits over the next few years. In view of this, we have launched several initiatives to reinforce our unique SWISS culture. Among other things, we aim to include our employees better in decision-making processes, redesign our workspaces and further enable collaboration across all our divisions. We also want to emphasize that our employees are our most important asset of all. That is why, this January, we created our “SWISS People’s Plane”: a brand-new Boeing 777-300ER liveried with the faces of 2,500 of our employees. Our Employer Value Proposition, too, is based on a claim that we believe is core to Swiss working conditions: people matter. We are also investing over CHF 6 billion in a new aircraft fleet, and are adding new destinations, too – all to give our customers the best possible air travel experience. Our new fleet flagship, the Boeing 777-300ER, offers a top-of-the-line inflight product, along with unbeatable economics in cost-per-seat terms. We will further be the world’s first airline to operate the Bombardier CSeries, a completely new short- haul transport that is half as loud as comparable aircraft to the human ear and uses 25% less fuel. So here we are also cultivating Switzerland’s reputation for being at the forefront of cleaner and more efficient technologies. And we have vastly expanded our operation in Geneva with a new local entity – based on the idea of local responsibility and Switzerland’s subsidiarity principle. We are also strengthening our product and services throughout the travel chain. 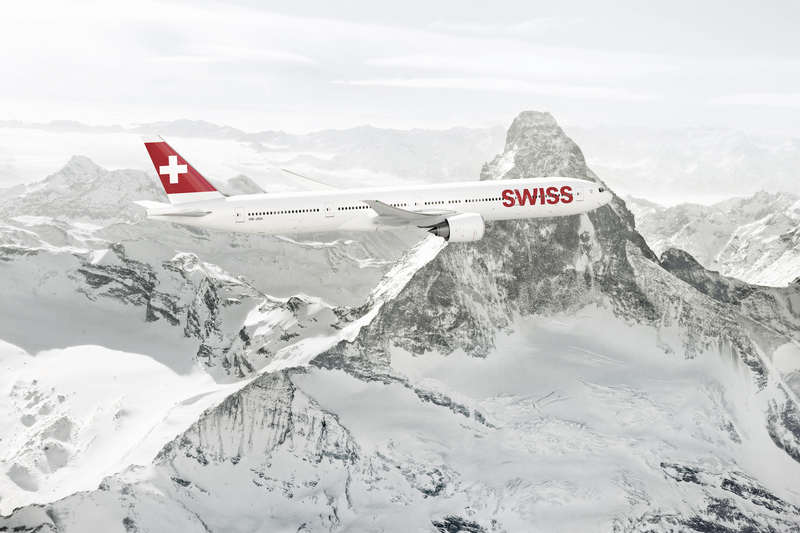 Our new aircraft offer the subtle luxury that Switzerland stands for. We rely on innovative Swiss suppliers, such as Lantal for our seat cushions or Bucher for our aircraft galleys. And we combine this with cutting-edge technology, such as internet connectivity aboard our new planes. Similarly, our new airport lounges are full of Swiss traditions, such as their Vitra and De Sede furniture, or the raclette and fondue that we plan to offer on the terrace of our First Class Lounge as a highlight for our foreign customers. In the digital realm, our swiss.com website, which has won a best-of-Swiss-web award, runs on all devices (desktop, mobile or tablet), and we were among the first airlines to offer such “responsive design”. We are continuously expanding our presence on innovative channels such as Google Flight Search, too. And it was to address increasingly individualized needs that we introduced our new fare concept for Europe in 2015. Lastly, we deliver our value proposition in close collaboration with our partners. Here, too, we follow key Swiss traditions such as respect and cooperation, be it with our staff associations, our strategic suppliers or our hub airport authority. In a similar vein, we substantially benefit from the synergies and contribute to the success of the Lufthansa Group. As an example of this strong collaboration, I have been assigned process responsibility for Revenue Management and Distribution for the entire Lufthansa Group, in addition to my role as CCO of SWISS. So our airline is continuing to evolve in the way of so many Swiss-based companies: rooted in Switzerland, internationally embedded. It is traditions that have made SWISS what it is today: one of Europe’s most successful airlines. Tradition and change are not incompatible. On the contrary, we must never forget the most important Swiss trait of all: adaptability. Only if we continuously evolve our traditions will we be able to survive in a rapidly-changing global environment. We are proud and grateful to carry the Swiss flag on our tailfins. It is what sets us apart today, and what will continue to do so tomorrow.